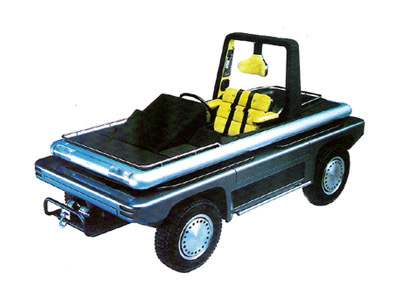 The single seat Daihatsu Trek was a peculiar concept vehicle from 1990 which had a trick up its sleeve. The Daihatsu Trek has the ability to take its sole occupant out to a remote area - assisted by its off-road wheels and front winch - and once there the steering wheel, seat, and roll-over bar fold away leaving a flat deck on which to sleep. To provide cover from the elements, a few minutes work erects a cover over the deck under which to relax. Basically it was a drivable bed with a tent on top. Thankfully the Daihatsu Trek never got further than the concept stage.